After Maspero: Have Egypt's Christians reconciled with the military? Dozens held a vigil in Cairo's Shobra district on Thursday to commemorate the third anniversary of the Maspero clashes that left 27 Copts dead. Egypt's Maspero Youth Union, Egypt's Copts Coalition and several revolutionary groups held the vigil in Shobra, a neighbourhood home to a large Coptic community, commemorating the deaths and demanding justice for the victims. Participants held candles and sang hymns amid a heavy security presence in the area. However, the vigil was ended upon police request after limited scuffles broke out between the participants and a small group chanted against the army, reported Al-Ahram Arabic news website. 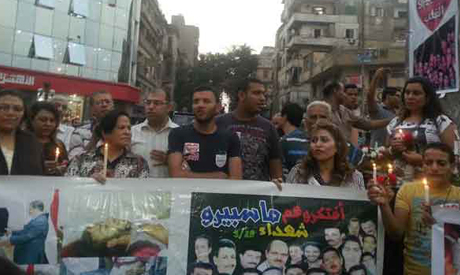 Another brief vigil of tens of activists was held on the steps of the Journalists Syndicate in downtown Cairo. Some held up photos of victims and army generals they deem responsible for the deadly incident. Meanwhile, families of the Maspero Martyrs Union announced that a memorial mass will be held on Friday in the Archangel Michael Church in Sixth of October on the outskirts of Giza where the victims are collectively buried. In the early evening hours of 9 October 2011, twenty-seven unarmed Christians were killed and more than 300 hundred injured in violent clashes with the army. Hundreds of peaceful Coptic protesters and allies had marched on the Maspero’s state television building in downtown Cairo to denounce discrimination against Copts and a spate of church burnings. Shortly after reaching their final destination, eye-witnesses say they were fired on. Later, video footage showed frenzied armoured personnel carriers running over protesters. The army maintained that unknown assailants opened fire on the soldiers guarding the TV building triggering a state of panic among the troops. In September 2012, three soldiers were charged with "involuntary manslaughter" and sentenced to two and three years in jail. The verdict was criticised by some rights activists as all investigations were led by the military itself. Over the past two years several Coptic rights and political groups have called for re-conducting investigations into the incident. These calls were reiterated again on the third anniversary of the incident by pro-Coptic rights political groups such as the left-of-centre Dostour Party. In a statement the party issued on Thursday, the party called for "holding those responsible for it accountable,” saying no action "was taken toward media outlets... that played an inciting role and manipulated the facts" during their coverage. Throughout the night of 9 October, armed vigilantes attacked Christians in the vicinity of the TV building. Courts looking into the Maspero clashes questioned Rasha Magdy, state television presenter who anchored the coverage of the clashes live from the studio that night, however, she was not convicted of any wrongdoing. Three fact-finding committees had been formed to look into the Maspero clashes: the first in 2011 under former prime minister Essam Sharaf, the second in 2012 under former president Mohamed Morsi and the third from the National Council for Human Rights. However, their reports were not made public. "We demand a neutral investigation into Maspero," George Ishaq, a member of the state body the National Council for Human Rights, told Ahram Arabic news website. Christians comprise about 15 percent of Egypt's 90 million population. three fact finding commitees to check the video tapes? What about the dead Muslims? Where is the grief for the Muslims who died? Why is there division in death? Egypt's Christians claim they are treated differently and smear Muslims and Islam in and outside of Egypt. At the same time they demand different treatment and discriminate against Muslims when they have the chance. If you want equality practice equality in life and death and show some compassion for the thousands of fellow Egyptians who died for change even if they are Muslims. they were targeted by the state army because they were christians, slighly different to normal demonstration victims. The murderers of the Copts and other Maspero protesters were inhuman state affiliated terrorists. The shame of this massacre will continue to haunt its perpetrators.